The cultural revolution of the 1960s witnessed a unique marriage of marijuana and art. Experimentation with LSD, peyote and other drugs were huge influences on the psychedelic art and music of the time, but marijuana motifs had a special significance for cannabis users during an era in which consumption was a risky proposition. Pot-centric counter-culture posters served as advertisements for rock concerts, publicity for anti-war candidates and statements on current affairs. Mike Storeim, the owner of Classic Posters in Evergreen, Colo., and a decades-long aficionado of 1960s posters and handbills, says the popular artwork of the time often had an unusual level of sophistication and detail to it. Among the genre’s luminaries is artist Stanley “Mouse” Miller, one of the “Big Five” San Francisco-based poster artists who had an international influence on the art that the 1960s. 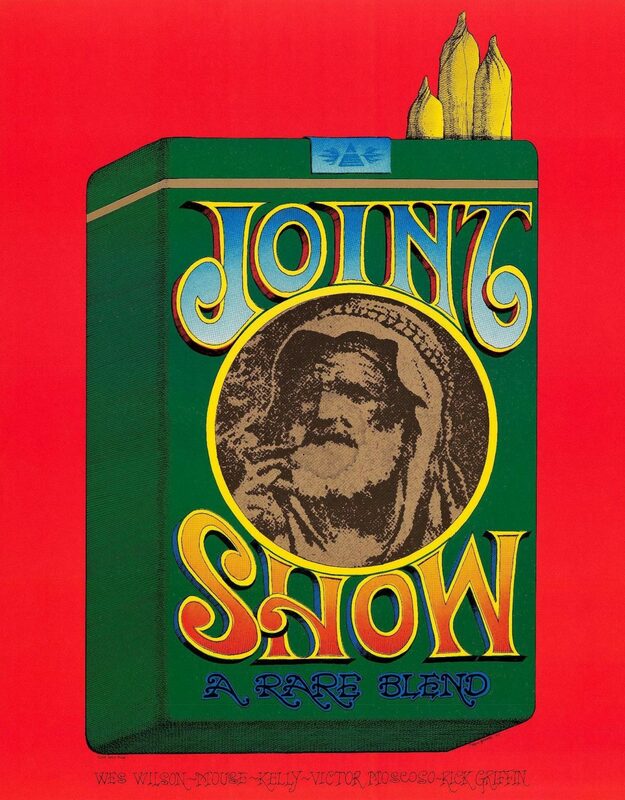 Scroll down to see Storeim’s picks from his collection of 1960s cannabis-themed posters. Southern California native Rick Griffin, one of the Big Five, was known for his highly-detailed illustrations. He was also a contributor to the underground comix movement of the 1960s and famous for album covers commissioned by The Grateful Dead. He died in a motorcycle accident in 1991. 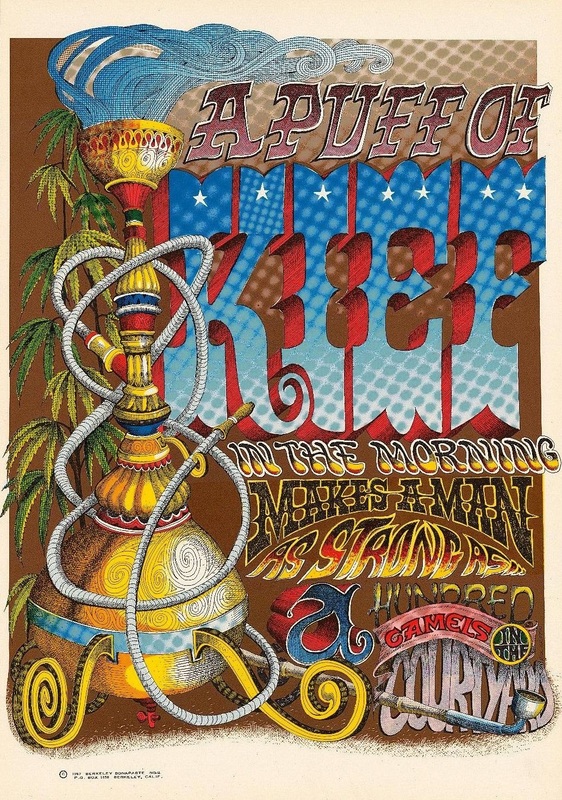 This 1967 illustration, featuring an elaborate hookah and equally elaborate lettering, is a classic example of Griffin’s work. The Joint Show was held at San Francisco’s Moore Gallery in 1969 and featured works by the Big Five artists, according to Storeim. Each of those artists was also commissioned to create a poster advertising the show. This particular poster, done by Rick Griffin, was an indication that even at its infancy in the 1960s the poster movement was being recognized for its influential impact on modern American art. 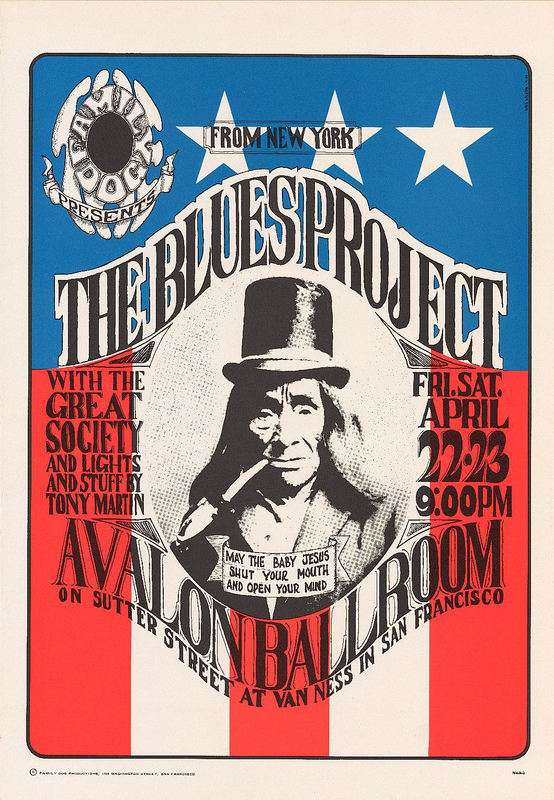 Many of the most famous rock acts of the 1960s played San Francisco’s Avalon Ballroom, shows that gave local poster artists steady work. Legendary Avalon acts immortalized in their art include the Steve Miller Band, Big Brother and the Holding Company (with Janis Joplin) and Quicksilver Messenger Service, to name a few. Most of the events at the Avalon were promoted by company/commune known as The Family Dog. Promoter Chet Helms, who ran The Family Dog, famously had the phrase, “May the baby Jesus shut your mouth and open your mind,” painted over the venue’s entrance. This 1966 poster, done by Big Five member Wes Wilson, featured what went on to become an iconic image for the Avalon — a Native American with a joint drawn in his mouth. 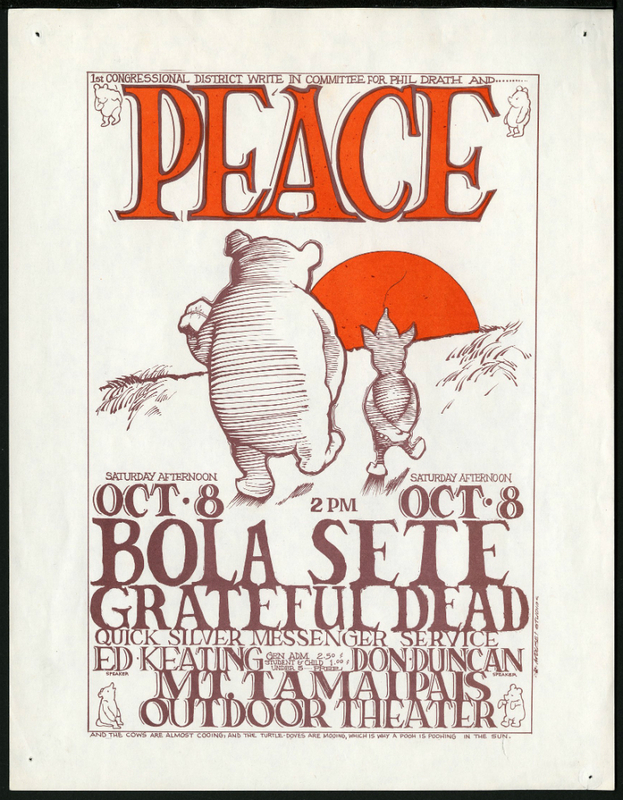 This 1966 poster promoted a benefit concert at Mount Tamalipas Outdoor Theater in Marin County for California congressional candidate, Phil Drath. The show for the anti-war candidate featured sets by The Grateful Dead, Quicksilver Messenger Service and other acts. The combined effort of Big Five alumni Mouse Miller and Alton Kelley, it shows Winnie the Pooh and his friend Piglet heading off into the sunset — Pooh clutches a kilo under his arm while little Piglet blows off a little trail of smoke. 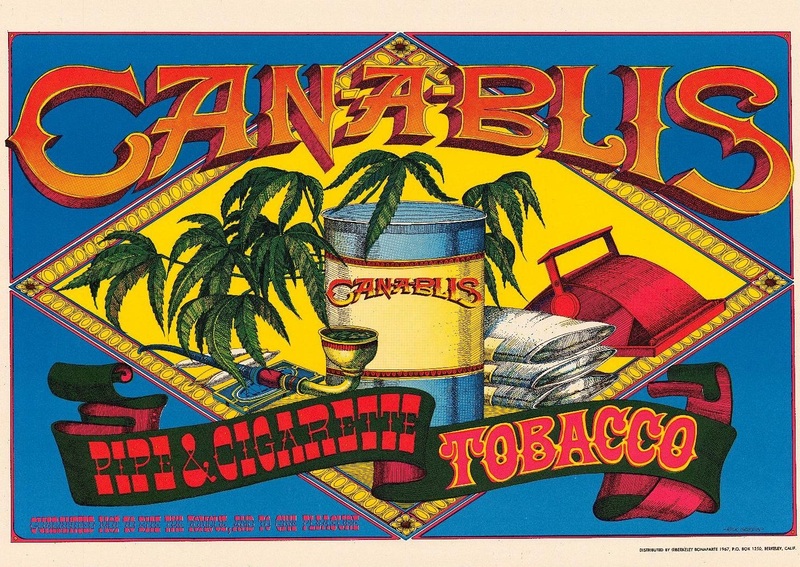 Another influential work by Big Five artist Rick Griffin, this 1967 poster is a faux advertisement for “pipe & cigarette tobacco” — but prominently features cannabis leaves. A head shop classic. 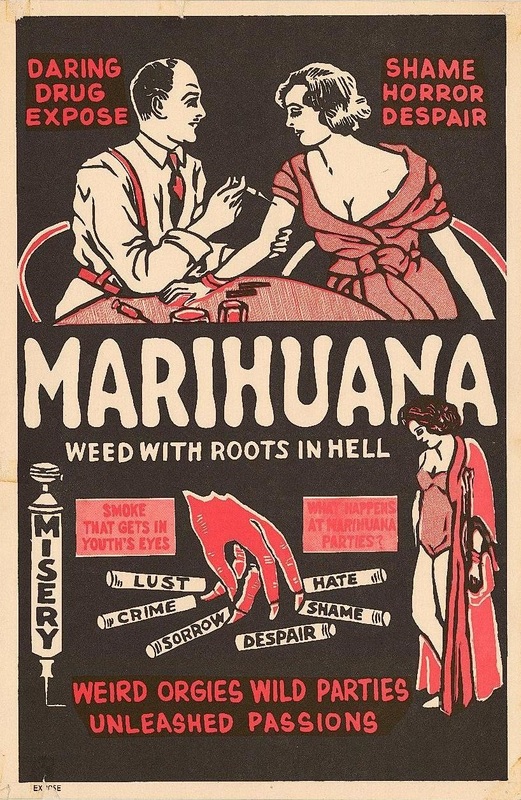 Marihuana: Weed With Roots in Hell, artist unknown. This poster promoted a 1930s anti-marijuana movie that, along with the equally infamous “Reefer Madness,” were seen as hilariously over-the-top scare tactics by cannabis enthusiasts in the 1960s – and a relic of a time when, as Storeim said, “everybody thought that cannabis would lead down the road to every form of depravity known to man.” So there was a certain level of irony for stoners when it came to hanging one of these posters, done by an unknown artist, on their wall.